Last week I went ahead and decided to make a new PDF download option available for some of my more length step-by-step postings. I also modified the postings to only include two columns in the table layout instead of three. This was because with certain resolutions the table was being cutoff and I am assuming going forward with the mobile devices this will become more of a common problem. So, what I decided was to put together an option that the reader could download and view offline if needed and to use with eReader type devices as well. 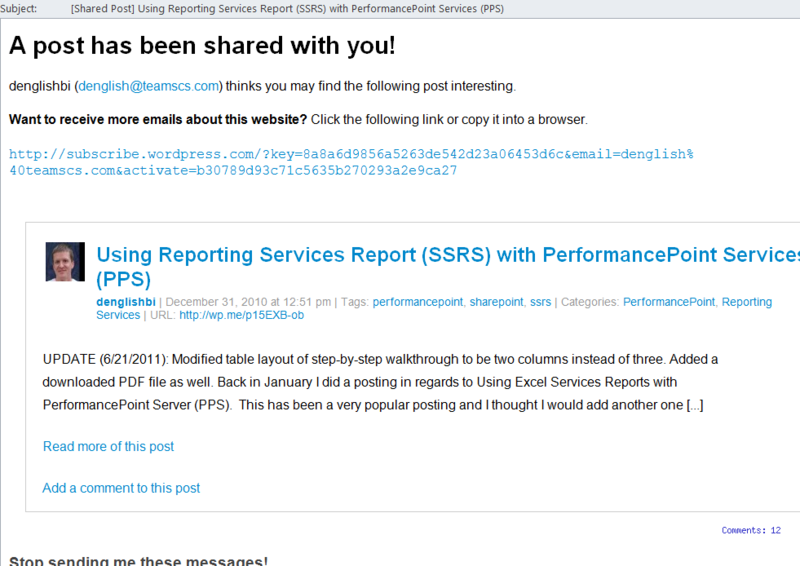 So far I have just done this for four of my more commonly read postings in regards to Using PerformancePoint with Excel Services, Reporting Services, and PowerPivot along with using SharePoint List data source in SSRS for parameter source. Going forward I will make sure that I include this option for this type of a posting. If you scroll to the bottom of these postings you will see the new option which includes a link to the PDF document that I have placed in my SkyDrive. I have also enabled some more options on the posts to be able to tweet them, print them (not the greatest output though, go with the PDF option if available), and to email them (creates a intro to the post with a link to read the full article). This Tweet option is made available with a plug-in for Live Writer for WordPress.com blogs – http://plugins.live.com/writer/detail/tweetmeme-for-wordpresscom-plugin. This is available from the home page and you do not need to click on the blog title to get at this Tweet option (only available on new blog posts or once that I repost through Live Writer). This functionality is made available in Settings –> Sharing options in Administration settings for the WordPress.com blog account settings. There are more options available, I only picked these three and there seemed to be an issue with the LinkedIn option. In order to see these options you have to click on a blog posting and it will be available at the bottom of the posting. If there is a particular blog posting that you would like to see in a PDF format feel free to leave a comment and I can add this option. I just picked a few of the more recent and commonly viewed postings to start with. Going forward though I will make sure that I have this available. This entry was posted on June 28, 2011 at 6:56 am	and is filed under Downloads, Personal Comments. Tagged: downloads. You can follow any responses to this entry through the RSS 2.0 feed. You can leave a response, or trackback from your own site. Cool idea! On the critical side – the images for the PDFs are a bit stretched – is it just me? The images are a bit, but that is probably because of the posting process from LiveWriter to WordPress and the images that get posted with the blog posting are sized a bit differently. The actual images are on the site as well and the hyperlinks are part of the document, so the user can click on them to view the full image which is a bit more crisp if needed. This was just an idea that I had for people that like to either print or have them available offline to reference. Plus with mobile and pad devices now or eReader devices this will be a really nice option for the lenghty postings. Yup, I’ll probably add PDFs for all or some of my posts, too.